I am a Red Sox fan but I watched the last game at Yankee Stadium last night with hubby, who is a big Yankee's fan. It was an emotional game. 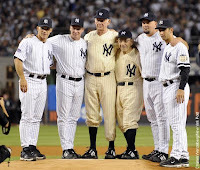 The beginning ceremonies were sentimental as we saw the best of the best that had played for the Yankee's years ago. Everytime I see Yogi Berra I get a little chill, its like when I see Johnny Pesky. The moment when Babe Ruth's daughter threw out the first pitch I could not help but tear up. It was such a surreal moment. To think that Yankee Stadium, the House that Ruth built, is over is sad. Ok, enough feeling bad for the freaking Yankee's ... let's go Red Sox. Tonight KO and I are going to the game. It will be chilly but it should be awesome! !